Like his Sire, he will produce top show quality offspring who will make their mark on the suri industry. You will have a hard time finding another male that can produce these type of numbers on their cria. Did I mention he is BLACK!!! Lox of Silk ID# 824801 ,DOB 10/21/2000. Lox is a big full Accoyo girl, probably my largest!!!!!! She has excellent conformation and beautiful fleece. 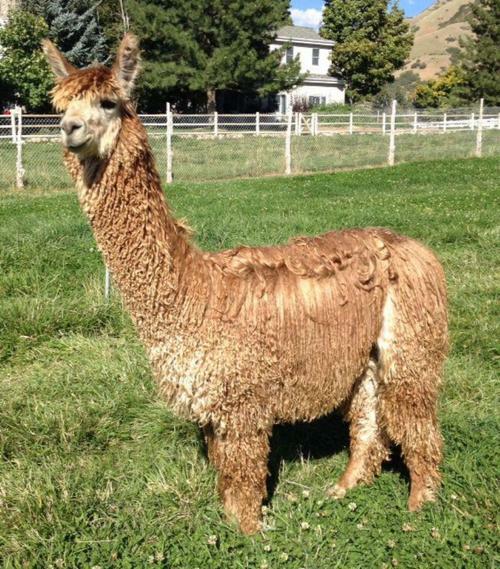 She has been one of my top foundation females who’s cria have been top sellers. 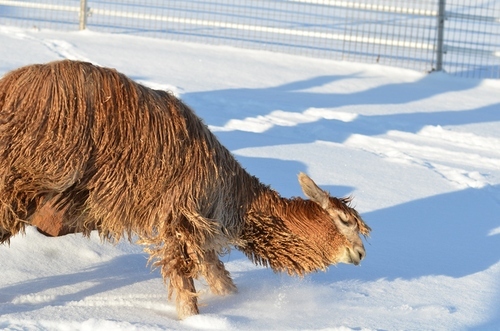 She has had 5 cria, 3 of which have been multi- champions. She is such a great mom and so patient with everyone. 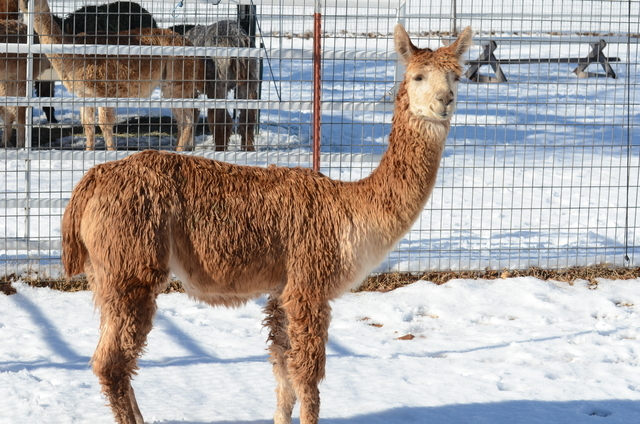 She produces so much milk her cria will often gain 2 lbs a day and she has no birthing problems. 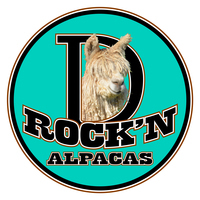 In 2013 Lox had a gorgeous male, Galloran, who has the most independent lock and luster of any of her past champions. He is making his name in the show ring this year. Lox is bred to our AOBA multi Champion and fawn full Accoyo, Haydn. 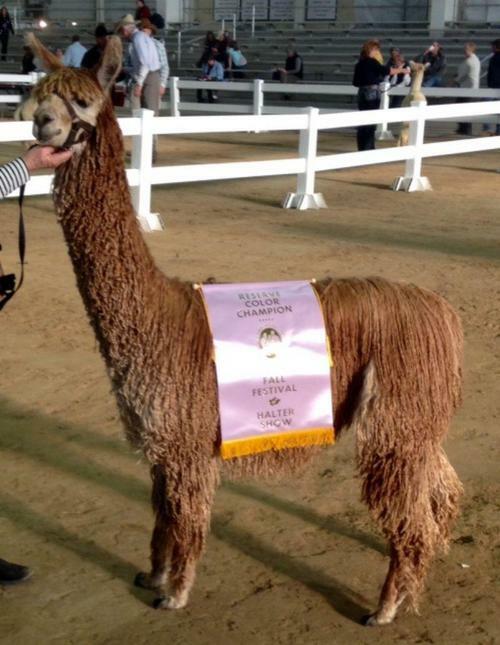 We feel this will be an outstanding match and will produce another champion and full Accoyo cria. Lox is due next Spring. I think she will produce another Champion. Galloran is a beautiful proven dark fawn. He is truly beauty in motion. His fiber is dense, compact, individual, roped locks, that drip with luster. He is the product of full Accoyo Lox of Silk and multi champion Sniper, son of Macgyver. From the beginning, Galloran displayed the stature of a champion and his fiber is amazing. 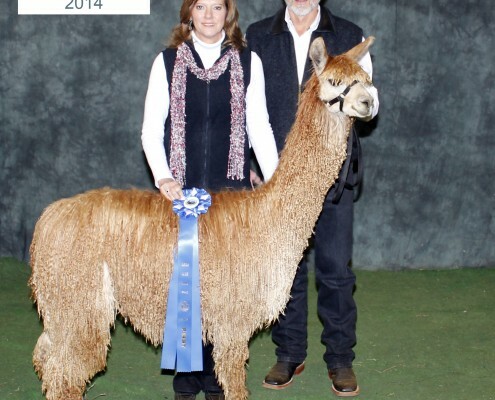 He has been shown and received several 1st place ribbons and Reserve Champion. 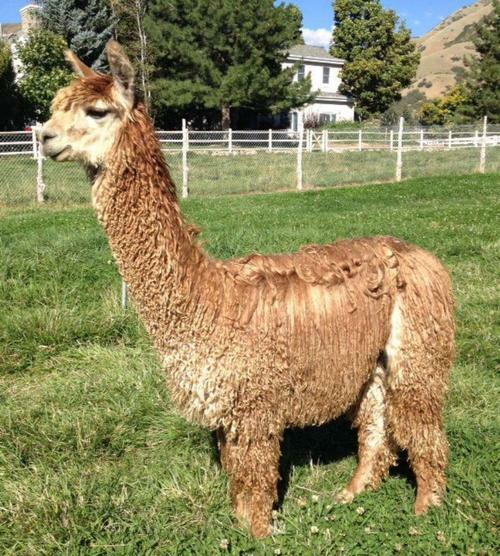 A suri alpaca of this quality is a rare find and he will improve any breeding program . His density is 52.75 follicles SQ MM of skin and his S/P ratio based on 25 typical fiber clusters is 9.2 to 1. He shows level 4 of 4 gland presence and 60°/o of his secondary fibers show a level of medullation. Note the presence of some round secondary fibers which some judges feel increases the luster of the fibers. a variation of 8.3 microns. Galloran's density and gland presence are above average for Suri males and are traits that he is likely to pass to his offspring if the female is not already more dense than he. Galloran is ready to be added to your breeding program, he's ready to get to work.